Constellation Brands Inc. (STZ) has corrected sharply lower since July. Prices are back to an area that should be long-term support so we could be looking at a good entry zone for new long positions. Let's check out a few charts and indicators to see if an attractive risk/reward situation has presented itself. In this daily bar chart of STZ, below, we can see the topping pattern from February through June. In late June prices gapped lower and started a sell-off that would mark down prices $70 or so. The decline was more rapid from October with prices in a cascade-like fall in December. This kind of decline can make prices more attractive to new buyers. A bearish death cross of the 50-day and 200-day moving averages can be seen in August and the declining 50-day line is still below the declining 200-day line. The daily On-Balance-Volume (OBV) line shows a decline from March and some recent stability at year-end. The trend-following Moving Average Convergence Divergence (MACD) oscillator just crossed to the upside for a cover shorts buy signal. In this weekly bar chart of STZ, below, we can see that prices are below the declining 40-week moving average line. Prices are back in an area of consolidation from 2016 and early 2017. Prices moved sideways between $140 and $170 for months and so far this area is acting as support now. The weekly OBV line shows just a three month decline in late 2018 so it doesn't suggest a long-term pattern of liquidation or selling. The weekly MACD oscillator is below the zero line in a sell mode and has yet to begin narrowing. In this Point and Figure chart of STZ, below, we can see the decline back to long-term support. 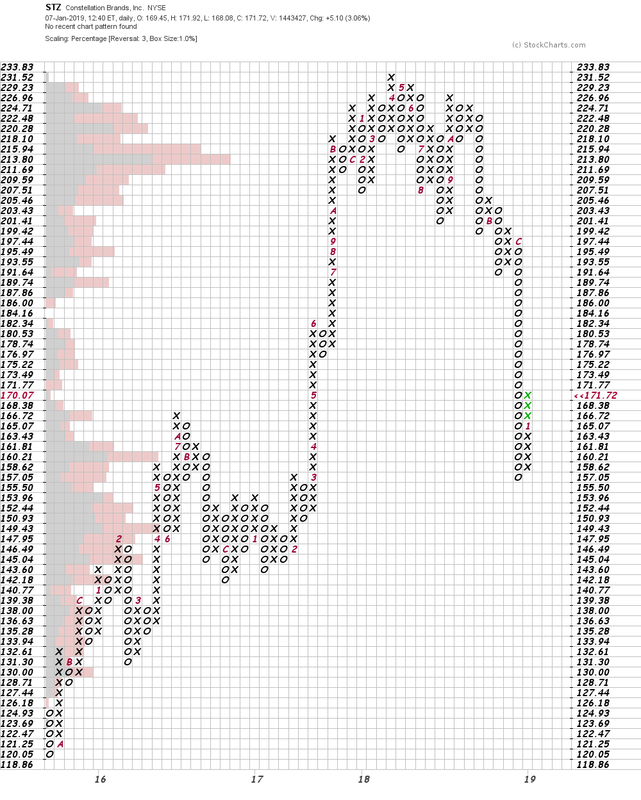 The horizontal bars on the left side of the chart show the amount of volume traded at various prices. It looks like a lot of volume was transacted from $160 and below and that gives me confidence that this will be a good area of support. Bottom line strategy: Aggressive traders could probe the long side of STZ at current levels and on a shallow dip. Risk a close below $155 and look for a recovery back to the $195-$200 area in the months ahead.